No, this isn't the plot of a B movie, this is actually happening. Tehran, the capital of Iran, has a rat problem. 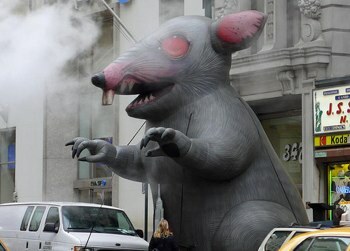 No, let me rephrase that: Tehran has a monster problem, and they just happen to look like rats. According to Tehran's city council, radiation and chemicals that have been used against the rodents over many years have mutated the typically diminutive pests. The rats currently roaming the streets can weigh as much as 11lbs, and are now larger than the cats that used to prey on them. Chemicals and poisons that were once utilized to keep the pest problem in check appear to have no effect on the new, larger breed, so Iran called in the big guns - literally. After the sun sets, snipers with infra-red capabilities take up positions around the capital and begin scanning for the mutant rodents. After a night of "pest control," the bodies of the freakish animals are either burned or buried in lime to prevent the spread of disease. According to city officials, over 2,200 of the cat-sized rats have been taken out, but that's just the beginning. The city hopes to flesh out the sniper brigade even further, eventually bumping up their numbers to as many as 40 armed, rat-murdering men in uniform.